Can Guinea Pigs Get Too Much Vitamins From Carrots? While most guinea pigs love to eat carrots or carrot peals, the crunchy vegetable isn’t as healthy as you may think. Carrots are packed full of sugars – yes, natural sugar, but sugar all the same – that aren’t healthy for your guinea pig. For most guinea pigs, variety is the spice of life. Many vegetables and fruits are safe for guinea pigs to consume, and supplementing their diet with fresh produce is essential for keeping them healthy. But some of the fruits and veggies guinea pigs love so much, like carrots, contain a lot of sugar, so you must limit how much your guinea pigs get. There’s no risk of your guinea pig getting too many vitamins or nutrients from carrots, but it is likely she will consume too much sugar by munching on large quantities of those crispy treats. Like human diets, eating foods high in sugar can lead to obesity and digestive complications in guinea pigs, along with an increased risk of developing diabetes. The bottom line is that although most guinea pigs will happily eat carrots or carrot peals, the high sugar content of carrots can be detrimental to their health. One of the benefits of feeding your guinea pigs fresh fruit and vegetables is that you’re providing them with vitamin C, also called ascorbic acid. Vitamin C aids the oxidation process; the absence of ascorbic acid in guinea pigs can lead to serious health issues including bone and vessel abnormalities, enlarged adrenal glands and scurvy. 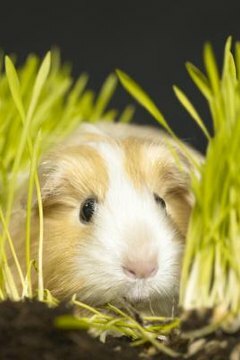 Because guinea pigs are unable to produce vitamin C on their own, it is vitally important to supplement their diet with at least 10 milligrams per day. Although it’s important to include vitamin C in your guinea pigs' diet, there’s a fine line between offering you guinea pig enough vitamin C-rich foods and feeding them sugary produce that could make them sick. Most baby carrots contain about 1.36 grams of sugar and .74 grams of vitamin C; that’s a relatively low amount of vitamin C compared with that of most fruits that contain a comparable amount of natural sugars. For instance, a serving of cherries has a similar sugar content but twice the vitamin C than the same size serving of baby carrots. Leafy greens are healthy alternatives for your cavies, because they have low sugar content and plenty of the vitamin C your guinea pig needs. If your guinea pigs adore a fresh, crunchy carrot, there’s no harm in mixing a few pieces into their salad. The key to a healthy, balanced guinea pig diet is moderation. Most guinea pig experts recommend 1 cup of fresh vegetables per day. That can include a maximum of two baby carrots, or a medium-size carrot cut into 2-inch pieces. Pair your guinea pigs' carrots with a low-sugar vegetable like romaine or green leaf lettuce to ensure they're getting the vitamins and nutrients they need without overloading on sugar. Julianne Kroon spends her days caring for animals as the owner an in-home pet sitting business and a dedicated humane society volunteer. She also serves as a national news editor for Internet Broadcasting and previously served as a reporter at a news radio station in Minnesota. Her work has been broadcast on KTOE Information Radio, KMSU Public Radio and featured in the "Mankato Free Press." What Does It Mean When Guinea Pigs Chew on Their Cage? What Kinds of Vegetables Do Canaries Eat? Is Plant-Tone Fertilizer Poisonous to Dogs? Does a Hamster Eat Yogurt? Can Sugar Gliders Have Vitamin D or C? Is Raw Cabbage Toxic to Your Pet Bird?